Learn how to cook brown rice perfectly on a stove top with ease each and every time without the aid of fancy kitchen gadgets. Rice is a dietary staple for most cultures, although for some more than others. Growing up in a Caribbean household meant learning how to cook rice almost immediately. I grew up on white rice but having learnt more about the health benefits of brown rice, I quickly transitioned to making my cultural cuisines such as rice and peas, pelau, arroz con coco and rice porridge with brown rice and hardly notice the difference. 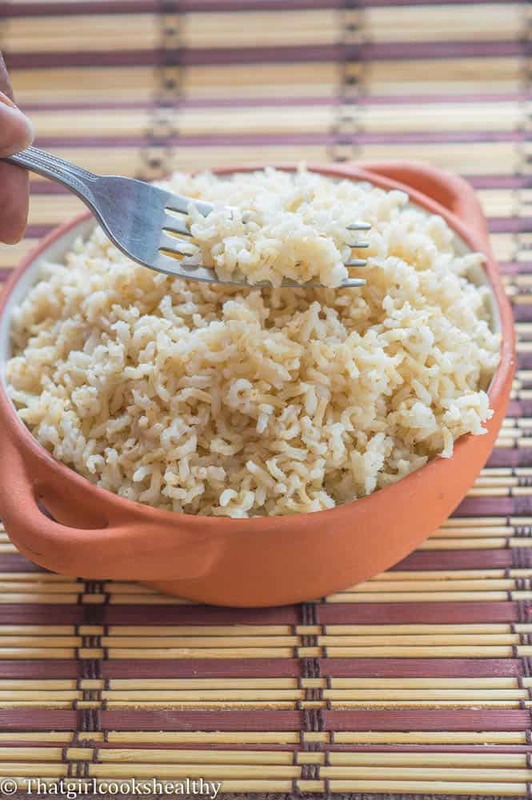 Brown rice vs white rice – is there a big difference? I think the major of talking points surrounding rice is the difference between white and brown rice. There is a slight difference in taste and texture which takes some getting used to. Brown rice is an unhulled grain with the bran, germ and endosperm still in tact. It is therefore an whole grain (complete grain) with all of its nutritional value still in tact. On the other hand, white rice is hulled so the bran and germ are removed. These elements are where the vast majority of the nutritional content are held which make it inferior in term of nutrients to it’s whole grain counterpart. Why do people consume white rice? There’s a myriad of reasons as to why white rice is highly favoured, sometimes it comes down to the cost. White rice is cheaper than brown rice. It’s also widely available in shops and supermarkets. There’s also the fact the some people find white rice more palatable due to the removal of the bran. High in mineral and vitamins – thiamine, niacin, B6, manganese, magnesium, phosphorus, iron and zinc. Why does rice make me bloated? During the digestive process high carbohydrate foods often produce more gas and the body sometimes cannot cope with the ability to breakdown such large amounts of carbs, coupled with the air that is swallowed from chewing. Individuals with disorders such as IBS, crohns are also more susceptible to bloating . There are ways to ease this problem which I will highlight below. 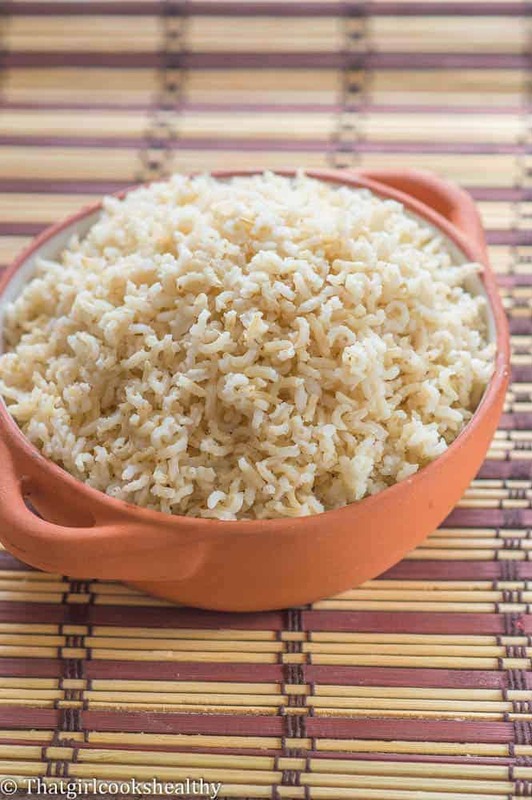 One of the keys to how to cook brown rice perfectly is in two words….soaking grains!! Soaking brown rice is great way of reducing cooking time and also aiding the ability to digest rice grains much better. Also, because brown rice contains high levels of arsenic from toxins and pesticides that can contaminate the rice, it’s even more important than ever to soak rice where possible. Soaking also helps with aiding the breakdown of nutrients and neutralises phytic. Phytic is a anti nutrient which can prevent the absorption of minerals like calcium and zinc which is important for bone strength. Prep the rice – First of all get your brown rice of choice ready – be it short or long grain. It’s up to you in terms of which one you see fit to use. I by default always use basmati brown rice because I enjoy the taste and texture of that rice. Rinsing rice – Use a strainer to rinse the rice, you want a food strainer that is large enough to accommodate the rice grains and run directly underneath the water. I like to use my hands to aid rinsing, the water will be cloudy from removing the starch and debris until it eventually becomes clear. It will take a good few minutes until the water runs clear DO NOT SKIP THIS STEP OR FAST TRACK RINSING. It is VERY important to ensure you rice water is clean and contains no toxins. Soaking the rice – place the washed rice in a bowl with a tablespoon of lime, stir, cover and set aside for several hours or overnight. This step will further rid any more debris and help to ease digestion. When preparing to cook the rice you want to strain off the lime water and rinse through to rid the lime completely. Now we can move onto cooking the rice. How do you make brown rice less mushy? This is a common complaint which comes down to failing to strike a balance of rice to liquid. Often resulting in soft sticky risotto. The formula for soft pillow fluffy rice is 2:1 parts water to 1 part rice. When you add your rice to a medium sized saucepan you want more water then rice (see the recipe card for the exact amount). Bring the water to the boil, simmer then leave to cook on low with the saucepan covered. Not only should the water assist with cooking the rice. The moist heat will steam the grains and absorb the water. Don’t uncover the rice before the recommended cooking time because you’ll let the heat escape and definitely don’t fluff the rice until it’s cooked. How many carbs in 1 cup of brown rice? A cup of brown rice contains 45g with a total of 215 calories . 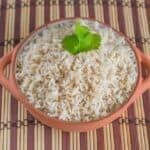 How to make brown rice taste better? It’s so easy how learning how to cooks brown rice perfectly – no instant pot, pressure cooker needed!! Use a strainer to rinse the rice several times until the water runs clear. Place the rice in a medium sized bowl with 1 tbsp of lime, stir, cover and set aside overnight or for several hours. Rinse off the rice with the lime water again a few times then transfer the brown rice to a medium sized saucepan. Add the 2 cups of water, pink salt and then bring the rice to a rapid boil. Reduce the heat to low, cover the saucepan with the lid and simmer for 30 minutes. Check the rice a few minutes towards the end of the given time with a fork. Store an leftover rice in the refrigerator for no more than 24 hours.